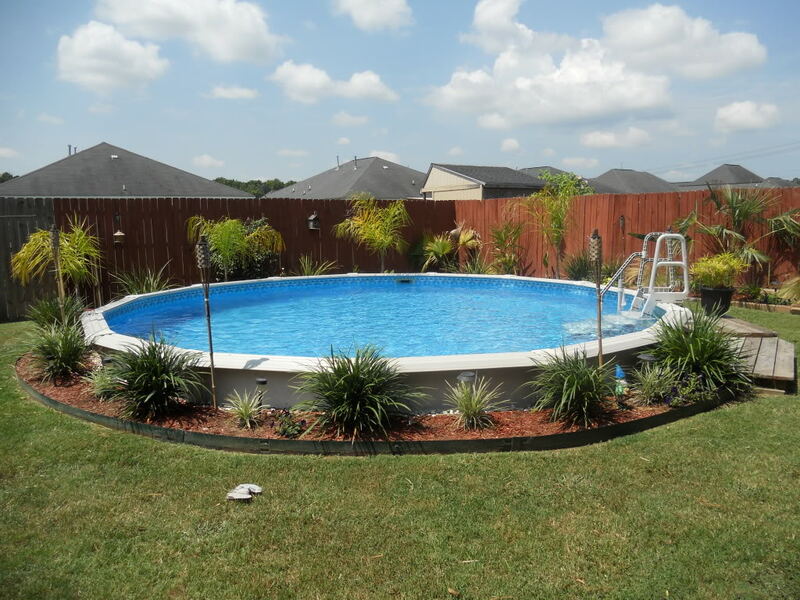 Lately, since the real estate crash of the mid 2000s, more and more homeowners are opting for an above ground pool rather than getting an in-ground. 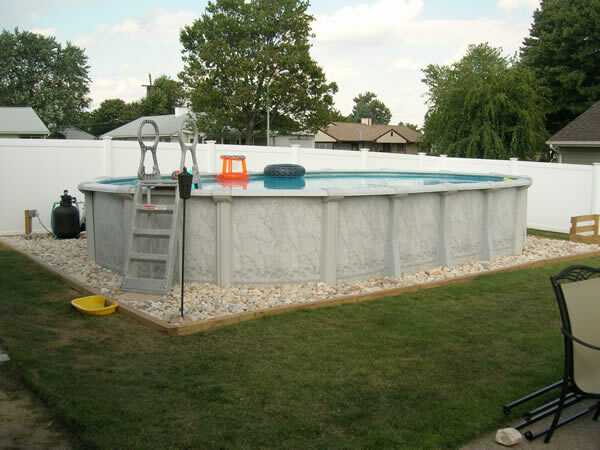 The biggest reason is the cost of in-ground pools as they have become really expensive. The average cost of an in-ground pool here in Central Florida is between $30 000 and $50 000 with the 30k one being pretty small. Because of this, above ground swimming pools aren’t just for the lower income households and people want to spend more to make them look good in their backyards. 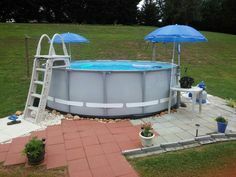 Traditionally, above ground pools have often been considered eyesores since they are ugly and stick up four feet off the ground. Some of the more affluent above ground buyers have an increased budget for their pool and how it looks in their backyard. That’s where landscaping around an above ground pool comes into play. A large, four-foot cylinder erected in the middle of a yard can look really ugly, but if you add some landscaping around it, the whole yard can look really nice and inviting. You may be surprised how that cylinder can look after you add a couple of small trees, some shrubs, decorative borders, walkways, mulch or rocks, and a nice deck. With the right landscaping, an above ground pool can look amazing. Like most things, landscaping will look best somewhat symmetrical and with some planning. Don’t just plant anything anywhere. First visualize how the entire yard will look. The bottom of an above ground should be maintained on the outside all the way around. Start there by creating a border of some kind at least a foot away from the bottom track. There are many borders to choose. I have seen timber, stone, concrete, and plastic ones. Add decorative rock or mulch in this area. It will create a beautiful transition and promote good drainage around the pool. That alone will make the pool look so much better. Consider where the pool’s equipment is. If it’s visible from the house, landscape around it again with a border, mulch/rocks, and maybe some small shrubs to hide it a little. Don’t plant anything too close to the equipment as you’ll always want good clear access to everything. Some will build a housing of some kind to cover the equipment. I never recommend that as it can be a pain to remove and get to the pump/filter for servicing, but if you build something nice, then it may help with the look. Regardless of how far your pool is from the house, adding a walkway is almost necessary for helping to keep the pool and the house cleaner. Bathers travelling back and forth on grass and dirt can make a bigger mess than you might think. Making a nice landscaped walkway is really a good opportunity to add to the look of the pool. There is a lot you can do here as some use patio stones for steps and use timbers to border it. Add some rocks or mulch and plant a few small shrubs along the way and it can look very inviting. Adding a deck? Landscape it. Above ground pool decks vary quite a bit in size and look. Some are small and very basic and only have steps and a simple handrail. Others are huge. They wrap all the way around the pool with a fancy rail and built-in seating and planters. Regardless of the size and style, all decks look better with some landscaping around it. Place some potted plants on the deck if there’s room and plant some taller bushes near its outside corners. If the deck is visible from the house, add some colorful annuals along its perimeter. Some will have a lattice covering the outside of their deck and they will plant vines along them. Adding some trees? Nice. Just don’t plant them too close. Having some plant life that’s higher than the height of the pool adds to the dimension and feel. Here in Central Florida, palm trees are nice to have in the backyard near the pool. They don’t drop a ton of leaves and they make a nice tropical noise as the wind blows their fronds. Any kind of tree is OK as long as you don’t plant them too close to the pool as their roots will eventually find their way underneath the pool. This isn’t too big of a deal, but you may feel the roots under the liner after some years of growth. Keep in mind too that as the trees get bigger, they will start to shed their leaves into the pool. Shade is really nice in the summer, but you’ll pay the price by having to remove a lot of leaves from the pool. Nothing makes landscaping “pop” more than lighting. 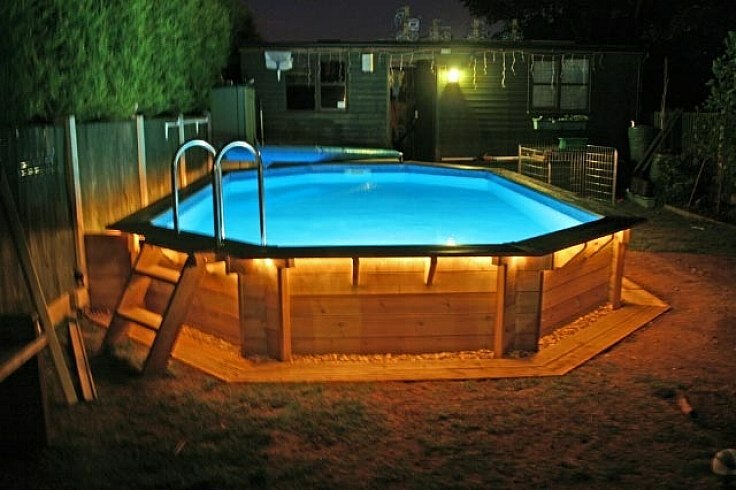 Add lights to your pool’s walkway. Drape some along the top of the deck for a more festive look. Point a light up the trees and/or light up a section of the pool’s wall. There is no substitute for direct wiring from your home’s power, but it’s not at all cheap. Solar powered lighting isn’t as good, but can be affordable for what you get. Incorporate these fun spots to your pool and landscape around them. Adding colorful plants to these areas will give a warmer feel when it’s cool and a cooler feel when it’s hot. OK, so this may be a little much, but hey, if you have the money and the time, why not? There’s something about the noise of flowing water that adds to the feel of a place. You may be surprised how many ponds I’ve come across in backyards. They are all beautiful when they are kept up. Good luck. and thats what you got out of the post? What is the best solar lights for on the deck ? I see motion detection ones and just regular ones. 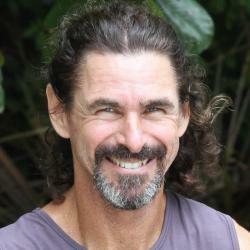 From Dan: I’m not sure what the best solar lights are as I am just a mere pool installer. You could do some research online on them though. I have an above ground pool. 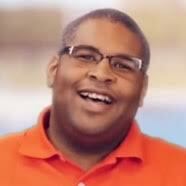 My question is, they had to go 12″ into earth on one side of the pool. What do I back fill with? The dirt that was pushed aside? Not sure what to do. You can backfill with anything. Using the earth that is there will be fine.